It's Smartphone Round Robin time and we're kicking off Round #1 with CrackBerry taking Android for a spin! 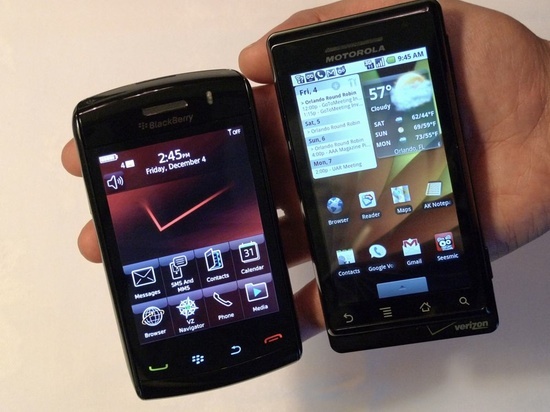 I know a lot of you out there are wanting to hear my thoughts on the Verizon/Motorola Droid, since it's a device that many BlackBerry Storm 9530 owners have either been tempted by or even jumped ship to rather than making the organic upgrade to the BlackBerry Storm2. So instead of making you all wait, we figured it was best to tackle this alien baby right away. Below you'll find a hands-on video of me taking my initial walk through of both the Droid and Sprint Hero with our resident Android expert, Casey Chan of AndroidCentral.com. As part of the discussion, I've created a CrackBerry on Android thread over at the Android Central forums as well. Speaking of forum threads, you'll want to jump into our CrackBerry forums to help out Matt Miller (palmsolo) who is off his Nokia devices to give the BlackBerry Bold 9700 and Storm2 a go this week. My full analysis and review will come on Friday, so stay tuned for that (teaser: there's things I like, things I really like and things I just can't stand). In the meantime, be sure to check out the video below and drop your thoughts in the comments. And don't forget - for your chance to win a device, you need to participate in the forum discussion (full details here).